If you attend the Idaho Bach Festival starting Tuesday, you’ll hear a five-string cello for what is likely the first time in your life. 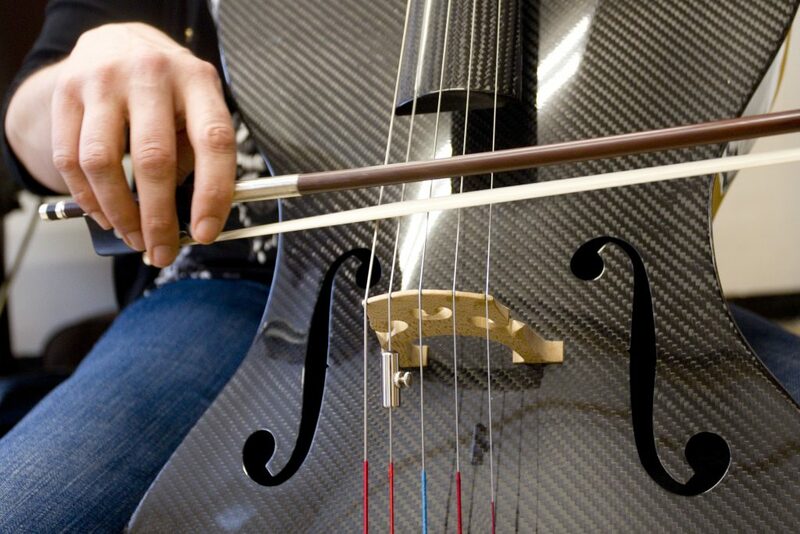 Associate Professor of Music Miranda Wilson plays her carbon fiber five-string cello in her office on Friday, Jan. 5, at the University of Moscow. Wilson will be playing J.S. Bach’s Six Suites for Solo Cello at the Seventh Annual Idaho Bach Festival. You wouldn’t have heard one before now because cellos don’t have five strings; they have four. But this wasn’t always the case. 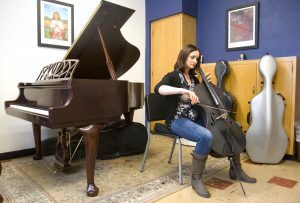 “Back in the day, the very idea of a cello was a fluid concept,” said Miranda Wilson, an associate professor of cello at the University of Idaho and co-director of the Idaho Bach Festival. Wilson explained that it took a while for people to figure out the optimal form and function of a cello. During the 1700’s, when Bach was around, some cellos had four strings and others had five. The shape and size varied as well. So, music written for a cello would have been played on a variety of cello-like instruments. Associate Professor of Music Miranda Wilson plays her carbon fiber five-string cello in her office on Friday, Jan. 5, at the University of Idaho in Moscow. Because the final suite is written for the five-string cello, it’s a very difficult piece for modern cellists to play, and they have to omit certain notes. 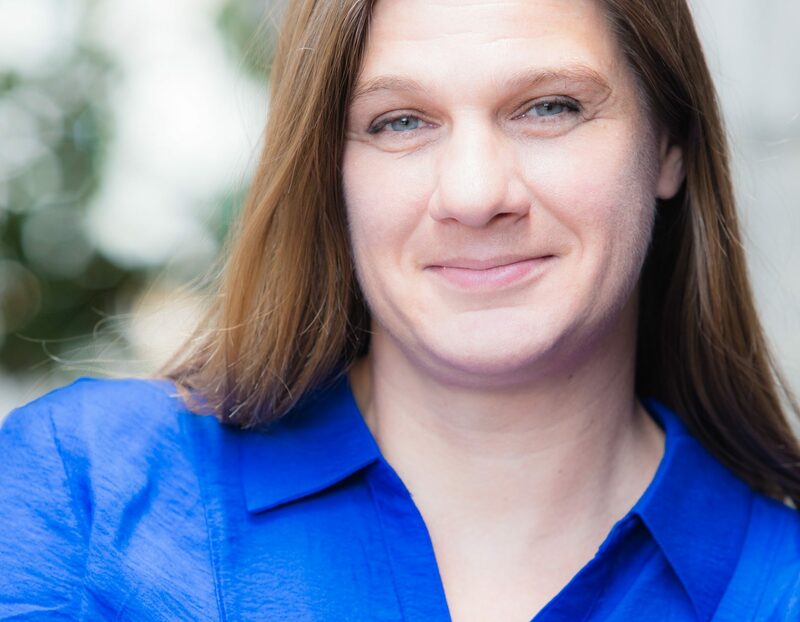 However, Tuesday night at the Idaho Bach Festival, listeners can hear “Six Suites for Solo Cello” in its complete form when Wilson plays on her five-string cello. She had long been curious about the five-string cello. There are just a handful of them out there. For the most part, original instruments from that era have been broken, lost or altered, and the consensus among those who’ve made custom instruments is that they just don’t sound good. Wilson wasn’t satisfied with that. The added string is on the higher tonal end, which means the cello can produce higher, more resonant sounds — a bit like a violin. No other stringed instrument can produce that range of sound. “The result is like if a cello and violin got together and had a baby,” Wilson said. The strings are closer together, making it challenging to play. Which is to say, you’re not likely to see five-string cellos make a comeback anytime soon. OF NOTE: A free Bach in the Round student performance is at noon Jan. 19 in the Idaho Commons Rotunda.